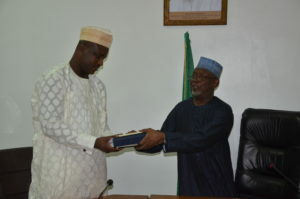 The baton of leadership of the Independent Corrupt Practices and Other Related Offences Commission has been handed over to the Secretary to the Commission, Dr. Musa Usman Abubakar. In a brief ceremony which was witnessed by the heads of departments and other senior management staff, the former acting Chairman of the Commission and two-term Board Member, Alh. Bako Abdullahi, said he was handing over to the Secretary as his tenure as a Member had come to an end. He expressed his gratitude to the government for having been given the opportunity to serve both as a Member and an acting Chairman on two different occasions. Alh. Abdullahi commended the Management and staff of the Commission for the support he had received from them saying it was tremendous. He therefore urged them to extend the same level of support to the Secretary. The out-gone acting Chairman also advised ICPC staff to intensify their efforts in eradicating corruption in Nigeria. He challenged the staff to not let the recent Transparency International’s rating of the country dampen their enthusiasm, but should rather see it as a shot in the arm for a renewed drive by the Commission to combat the evil that corruption represents. In his own response after receiving the handing-over documents, the Secretary eulogized the out-gone Chairman saying the task of running a strategic organisation like ICPC was an onerous one, and that having worked directly with Alh. Abdullahi, he could attest to the awesome responsibility it entails and how diligently the out-gone Chairman had discharged his duties. Dr. Abubakar therefore solicited for staff cooperation saying it was needed if he was to succeed in carrying the heavy burden being placed on his shoulders. He promised to put in his best in order to make the Commission better in all ramifications. It may be recalled that a new Chairman and Members nominated by the Federal Government for ICPC are awaiting confirmation by the Senate as stipulated in the Corrupt Practices and Other Related Offences Act 2000. It is expected that until their confirmation, the Secretary, Dr. Abubakar will oversee the affairs of the Commission.